FREE 18.5oz Lipton Pure Leaf Tea at Thorntons! 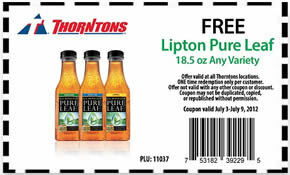 Bring this coupon to your local Thornton's store to get a free 18.5oz Lipton Pure Leaf Tea! (click the coupon tab to access it) Expires 7/9/12.